There are many ways that drones benefit society—but unfortunately, with the rise of drones comes the rise of malicious activity. Dedrone is a company which offers an automatic, anti-drone solution for their clients. Prisons, large events, and even presidential debates require solutions that can repel drones with bad intentions. Sebastian Blum, VP of BD at Dedrone, joins Ian to reveal the fascinating technology that Dedrone uses to keeps their clients safe. Follow Sebastian Blum on Twitter @LeBastif. [00:00:00] [Advertisement]:This episode is brought to you by UpSonder, the easiest way to monetize your drone with the industry’s only Million Dollar protection coverage free to its members UpSonder is the top choice among certified drone pilots to get up and stay up to get started. Create your free listing today at upsondor.com. 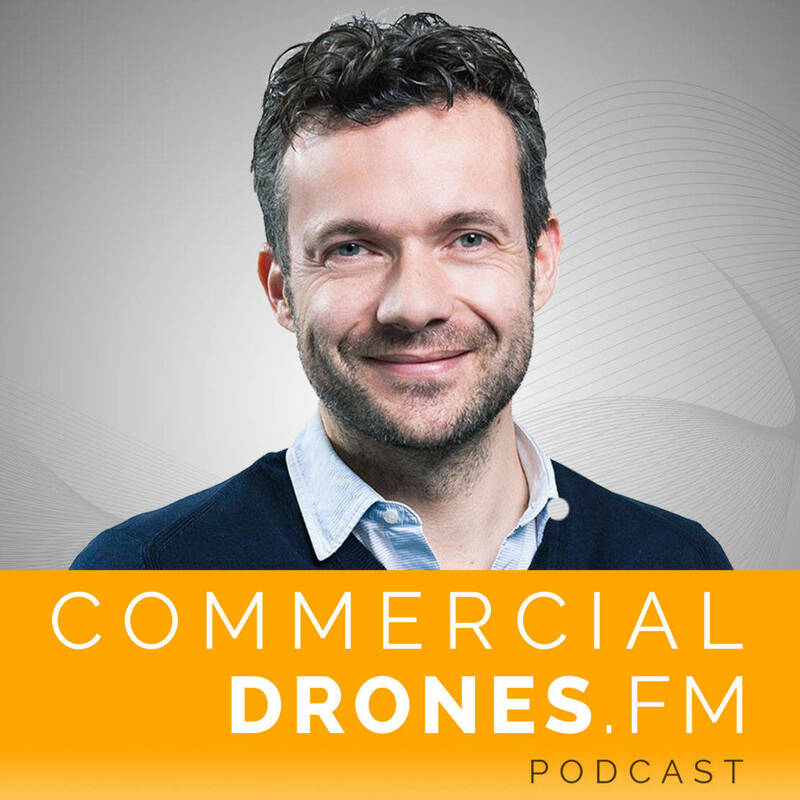 [00:00:22] [Introduction] Welcome to Commercial Drones.FM, the podcast that explores the commercial drone industry the people who power it and the concepts that drive it. I’m your host Ian Smith. [00:00:36] IAN SMITH: Hey everybody, welcome to commercial drones. Fm. Today I’m here with Sebastian Blum, VP of BD at DeDrone at their office here in San Francisco. So thanks so much for having me here at your office Sebastian. And thank you for joining us on the show. [00:00:53] SEBASTIAN BLUM: Thank you so much. Great to have you. [00:00:55] IAN: What is the DeDrone? [00:00:56] SEBASTIAN: Wow, what is DeDrone. We do a lot of things but I think in a nutshell we kind of help property owners enterprises data centers prisons kind of like protect against bad guys wanting to use drones for their intentions whether it’s bringing in explosives gun smuggling drugs all that kind of stuff. And you know drones can pretty capable. And we kind of help property owners feel more in control of their own airspace and their property. [00:01:22] IAN: And you are a German company right? [00:01:24] SEBASTIAN: Well technically we are an American company now we are headquartered here in San Francisco where an INC incorporated here. If you check out where we are from originally. There’s a bunch of Germans in the company were pretty I would say heterogeneous team in terms of nationalities represented. We’ve got people from Asia, from Europe, from here Latin America even represented two people. So we’re pretty diverse. But yes a lot of people kind of claim or think that we’re German because that’s where we originally founded. And I hope you don’t hear a big accent from me. I’m from Germany. [00:02:00] IAN: You sound like you’re American basically. I get a little just a little bit. [00:02:04] SEBASTIAN: The Germans are everywhere. [00:02:07] IAN: We’ll just getting a little bit more to the point so if I go to your Web site there’s some stuff where there’s like like red circles with the cross on it and then right behind that it’s crossing out a drone. So this show of course is Commercial Drones. Fm the podcast. We got a lot of people that say that listen to the show and our commercial drone operators so what. How would you describe the DeDrone to them? I mean you guys are keeping the airspace safe from malicious drones? or like every drone, like are you guys just like anti-drone people? [00:02:41] SEBASTIAN: No I think anti-drone is probably a bit misleading I think. Certainly we try to take advantage in our collateral marketing material of colors color coding and pictures to suggest that we are a security company and we help people get informed when something happens around their property and people have put fences up they have privacy topics they want to protect against. So certainly yes one may take away from the color coding and the website that we are anti-drone. [00:03:10] But I think we big drone fans ourselves a lot of people fly drones in our company our founder and one of our founders and CEO he built a UAV company before so we are embracing drones. However the intention of our business is to detect drones and do that for a very specific purpose and people that come to us they want to protect against people kind of abusing that technology. And that’s why I think again compounding anti-drone is a bit too misleading. [00:03:40] We want to detect drones and detect them for a good purpose of notifying people and wanting to do something that is not intrusive not shooting down. Very soft alerting them and making them aware that something is flying above their property and heads. [00:03:55] IAN: So that’s great to learn because whenever I was reaching out to Lucy actually to schedule this shout out to Lucy over here I thought this is going oh this is going to be controversial. They’re kind of anti-drone company and everything in their marketing kind of seems like it. But then I went to your Web site and then I was like oh this makes perfect sense so thank you for the explanation and I encourage anyone who is a little curious to go check out the Web site and really understand. So your product or service I guess it’s kind of both. You guys do hardware and software. [00:04:29] SEBASTIAN: Yes right now in our product portfolio we have a mix. We emphasize a lot on our own tracker platform which is you know pure software running on the premise and kind of crunching the data coming from sensors that face up around the property and in our product portfolio, we also have to sensors ourselves which is a drone tracker that is pretty prominent on the web site does this White Cross that has three sensors inside and we separately have also a tiny box with two antennas in the back which is our software defined radio. Radio frequency sensor so it’s both very cool. [00:05:05] IAN: So what it kind of like some of the specs on on like the hardware like the detection range I mean how far can you guys. Can your technology detect a drone. I mean what are the what are the limitations here? [00:05:19] SEBASTIAN: Yeah right. So. So range is a big question for people always and I think it’s something that is that needs to be talked about a lot because at first people always come look I want to have detection range of I don’t know 20,30,40,50 miles out. They want to get an early alert and a lot of lead time before a joint might enter. But to be honest look if I’m in this building here right now we are downtown San Francisco and Soma. We’re in seventh and Fallston and if we were to go out let’s say 20,30 kilometers we would see a lot of activity potentially that is actually super irrelevant for what I’m trying to protect against. [00:05:55] So kind of I think the analogy of the signal to noise ratio is very important here. I don’t want the customer to be overwhelmed with noise around you know too many drones that are somewhere on the horizon some dad playing with his son because they just bought a you know three or solo DJI whatever. And that drone never coming close so we want to be very respectful in our product. And you know when when security people use it to be alerted when it’s relevant that’s very very important now relevance comes in many forms it comes. You know. Yes. I want to have an early detection far out but trajectory velocity direction. That’s all very important. Some sensors give me an ability to look at very far. But there is potentially also characteristics involved like cost of that sensor. [00:06:48] Scalability some sensors may have hazardous aspects to them because they beam out and they they send out frequencies. And so compounding I think the drone tracker platform for our customers is very important but they can hook into different sensors depending on their requirements whether they want to look far. They wonder whether they want to look close. Cost is always an issue all of it always. Yeah. And so so when you look at the software it not the software platform is agnostic. We want to give the customer an ability to hook into any sensor. Now you mentioned our own sensors the two products I mentioned earlier. So there we have a strong philosophy around it being very cost effective. [00:07:32] IAN: Oh so wait so you’re saying I want to I want you to finish that what you’re saying. So there’s different types of sensors that are out there. [00:07:38] SEBASTIAN: Yeah there are different technologies that people have used to detect things, it’s video. It’s microphone’s sonic ultrasonic. It’s radio frequency scanning. People have used radars in the past. And and certainly there would be a lot of progress and technology coming up with these devices and sensors and we expect a lot of companies to just specifically focus on that large companies you know multinational companies all over the world that have already you know camera technology there’s lots of CCTV camera manufacturers there’s lots of radar companies there’s you know here in Silicon Valley lots of companies that build radio frequency technology you know Wi-Fi technology and all these companies at some point I think will jump on this in a more dramatic way. [00:08:24] But coming back to the point you asked about our own sensors and I wanted to just mention that for a brief minute so that the two sensors that we have depending on the area that we’re in whether we are in an urban area downtown San Francisco or we are somewhere far out that say in a desert environment where somebody is running you know secretive kind of dark underbelly or you know. Doctor let me say the you know is an example perhaps the Gigafactory right of Tesla which is certainly a property that’s that has high security demand. I mean these these environments are very very different and again dependent on these differences and the needs of the customer. We can connect to different sensor. I keep kind of spinning around here. [00:09:05] IAN: I’m fascinated, you never hear about this. [00:09:09] SEBASTIAN:We’re too. So our own sensors give you a distance depending on the environment day and night kind of conditions weather conditions. Also when the RF is involved obviously you need to take into account Hammad how many other antennas you have and devices sending out frequencies. But we get about roughly and a combination of these sensors. Let’s say up to a kilometer of a distance of range. [00:09:36] And certainly I think we are still in the beginning of this evolution of the technology lot of R&D money will flow into this whether it’s coming from venture capitalists or big companies and I think that you will see a lot of progress where people will be able to squeeze up more and more distance and range and precision from from existing hardware. [00:09:57] IAN: Are you guys venture funded? [00:09:58] SEBASTIAN: Yes we are. We started out bootstrapped like many many startups and we tried to extend that as much as possible so that we you know hit the market fundraising with you know hopefully product which we did. And we got our seed round in in Germany from a Munich based venture fund. And then we came into the yes flip the company and we’re very proud to have many little ventures that series A investor. [00:10:24] IAN: Awesome. How much was the series A? [00:10:25] SEBASTIAN: It was 10 million. [00:10:27] IAN: Cool. Awesome. Yeah you get some nice office here. So if I tried to fly a drone outside your office right now what would happen? [00:10:34] SEBASTIAN: Well we would pick it up I don’t know if. [00:10:36] IAN: You’ve got the technology involved, installed rather. [00:10:40] SEBASTIAN:Exactly if you are your audience somebody is driving down Folsom Street then you’re stopping and approaching 7th Street just look up part a bit to the right. There’s a block building and color coded in black and at the top rim on the second floor you know to join trackers facing Fossum and one side facing Fossilman two 7th street. So yes we would pick it up. We have started already when we moved in here first of July to kind of dedrone San Francisco. [00:11:06] And we were checking out a lot of things. It’s interesting to see the activity even though we’re in an urban environment and you know legally speaking in San Francisco it’s very hard to fly a drone because most of the areas you know it’s forbidden legally but we do pick up on activity. [00:11:22] IAN: Wow. OK. So you guys can have so many different kinds of clients that’s pretty my mind is going a thousand miles an hour here just trying to think of it so. OK how does this what happens. Like if I find my truth. What do you guys see? or what does the client see? Like how does this kind of work? I mean can you pick up like find my name or my address? Like what do you know about me and how does this what happens to my drone if I do fly my drone over here like what could happen is it going to fall out of the sky? [00:11:55] SEBASTIAN: You know we actually know a lot more about you then that, no just kidding. [00:12:00] IAN: So yes, our sensors pick up something they don’t track a platform kind of crunches and trying to find the needle in the haystack from all the things you know flying around. Whether it’s birds leaves whether it’s you know shadow reflections from sun rays and clouds whether it’s you know cars on the horizon because in some areas it might be you know a heavily populated traffic you know highways et cetera. So from analyzing all that data we try to find drones by either you know the microphone so the pulsating elements the sound patterns. Now OK that may work really well with a quadcopter, Hexacopter or you know a drone that has you know these rotor blades. [00:12:41] IAN: They do have a very distinct sound signature. [00:12:45] SEBASTIAN: Exactly but what’s important to say there is drones out there that don’t emit sound. There’s fixed wing glider drones and you know even if you are in an environment where there’s lots of noise around you know that doesn’t work. So you can already see from that approach that a single sensor approach doesn’t really work 100 percent well. So then you know our camera systems might pick it up. We have an ability to look out with with our joint tracker because with a camera unit and there we kind of match from what we know from patterns and our joined in a database where we classify all drones that we see in the market. [00:13:22] IAN: So computer vision? [00:13:24] SEBASTIAN: Exactly we have a great machine learning algorithms in place that you know kind of try to pick up and you go in and increase the ability to much quicker identify these flying objects and distinctively say look this is not a jumbo jet on the horizon which may have the same pixels amount on the system when we recognize it versus let’s say a drone that is you know just 50 40 50 60 meters away. But the again you know if you’re if you want to do this at night you know the camera is not good again. Then you need either a night vision camera OK or that’s you know the third sensor the radio frequency sensor works really well in that environment day and night. [00:14:08] Where we are trying to pick up, you know codes that are flowing around in the air. It’s frequencies that we analyze where we look for steering codes where we look for telemetry data that that drones are sending back to a remote control or to some other unit or even the camera itself because you know drones have a lot of times. Cameras mounted underneath. And some of them not only stored locally that data on these SD cards but sometimes in real time they send it back to to another place. So there’s a lot of stuff you can kind of check out in the air and in that combination we then given the alert to the you know security operations center where all product is integrated. [00:14:51] Next to other security products of an enterprise and then things are triggered let me say counter-measures may be triggered and but beforehand we and you ask something you know what can we identify we can identify the drone the type the model we in specific cases can tell you this is a very unique drone. Sorry this is a very specific drone that we have seen perhaps in other places that we have seen recurrently coming in. So there’s a menace of menace to the skies. Exactly so we can basically tell our customers a lot more than just hey there’s something flying above your head and we’re building. We’re trying to help them build up a lot of analytics around them and that’s going to then trigger different countermeasures that they are of are defining themselves. [00:15:39] IAN: What happens to the drone? I mean is it automatically shot out of the sky? I mean I guess it depends on the client right. I think that’s what you’re alluding to. [00:15:46] SEBASTIAN: Yeah that’s I think that’s a stereotype kind of thinking right kind of take it down because I fear and you know on a general level I think the drone industry is incredibly amazing and we’re just seeing the tip of the iceberg. But you pretty much have two camps right other people that love it fantastically well they want to have drones and want to fly or on the other side people that fear massively. And I think naturally speaking you know it’s something above us right it’s like in that movie Birds from Alfred Hitchcock that you know we are paranoid about what’s happening because we don’t have eyes on top of our head or in the back. So it’s this like evil thing that might be above our heads where we like. Who is that and what are they doing? [00:16:26] So people naturally have a tendency to say like let me shoot it down but the problem is that in many countries here in the U.S. and in Europe in many countries and elsewhere as well it is legally not allowed to to shoot something down and it’s not legally allowed to also interfere with radio communication that would then perhaps trigger to go down. [00:16:46] IAN: Yes, endangering something on the surface. [00:16:50] SEBASTIAN: Exactly. So we are kind of like in this limbo mode still from a regulatory perspective where regulatory bodies are still evaluating and trying to formulate rules in place. But again it comes back to our product pitch and that’s why I think we are you know there to help make it a safer world right now where property owners facility managers security managers say look I don’t want to wait until D.C. or somebody else comes up with rules. I want to be in control and at least want to have detection in place and a system where I feel safer. And I know what’s going on around me. [00:17:26] IAN: Do you guys own the airspace above your building? [00:17:30] SEBASTIAN: Oh my goodness. You’re asking me a difficult question and that you know again. I should put on my German accent now so I am not super familiar with the current law making. But I believe it’s. No, we’re not. And it’s not our property and thus I cannot interfere with anything happening above me. There’s certainly probably no gray zones if I feel that you know that’s potentially life at stake then certainly in depending on legislation. [00:18:02] And I think probably in the US it’s different very much from state to state. I’m in a position to do something but again we are we are as a company not trying to propagate. Hey here’s a system that detects and shoots down. We are a company that’s focusing a lot on detection. We give a lot of ability for security managers to then assess the risk and with functions like triangulation that we’re giving to our customers where we’re telling them Look the remote control and the pilot is isn’t close by and we can give the position they can send out a security operations person to go in and find that person. So we’re trying to give a lot of things that are not interfering massively and and doing something that has big consequences if you know which is in fact when you try to shoot something. [00:18:54] IAN: Now what about any recent use cases or specific scenarios where your technology was deployed. Can you share any stories about that? [00:19:05] SEBASTIAN: Yeah I can tell you tons and look I mean we were very excited because as a company the technology has a demand from any sort of vertical anybody who has a fence is in need of an aerial equivalent. Because that investment in the fence is kind of toast with drones coming in. So yes our case studies are quite diverse. We can talk about every installation because obviously within the security business and or want to protect something. So but there’s a couple of things we can we can talk about. So first let me start off. Prisons are great customers and first happened first customers of ours. They have had the problem that people tried to deliver goods to the the cells. [00:19:51] IAN: Drugs, weapons, cell phones, all things. [00:19:54] SEBASTIAN: Like charging units for mobile phones and when you know one of our prison customers we had intense conversations when we came up with a product proposal because we tried to learn from our customers you know how we should tweak the product etc. You know they told us look the the supply chain is is actually really perfect that it’s almost like ordering Chinese food. And some of these places. [00:20:22] So yes on our Web site you can see a video I think we still have it up of how easy it is to deliver a gun into a prison so yes that is a vertical that is very interesting. We have one prison that we can talk about is the Suffolk County prison and the state of New York. In Germany we have a couple of customers in that vertical and that’s certainly picking up and it’s very obvious I think. Another one is stadiums. The New York Mets is a reference installation the Citi Field Stadium in New York. And the interesting case there is the intent to secure and detect Jones was not so much to of offense of terroristic activity which would have been probably the obvious one but it was to protect top line revenue. [00:21:08] They have very extensive agreements with broadcasters and TV companies and you know people are using drones to fly into stadiums hover above the game and stream it live because these drones are first flying very stable at high velocity and speed and their camera systems are crazy awesome. So it makes a good case for somebody to just watch the game and stream it live somewhere in there. You know the analytics that we have after we install our system and it was late April that we went live, within a month we saw 45 drones coming in. So on average we have an incident of one and a half drones every day. And while people at their property have you know seen randomly here and there are drones. [00:21:56] IAN: Are you saying your whole network, one and a half incidents per day. [00:22:01] SEBASTIAN: Exactly exactly. And I think its important to say look you may see a drone above your house when you walk outside but you won’t see every drone because you know you’re going to be in the house you’re going to be away from your house et cetera. The same with you know with Enterprise property. So a lot of times security operations people can with our system in place now build a lot of know how and in lunatic’s and will then secondly be in a position to much much more assess the risk and then assess what are we going to perhaps do with third party countermeasures. [00:22:32] But first detection is most important and that’s I think what that reference installation and then he showed us in the last one we were super proud of is you know something I think we haven’t mentioned to anybody in public. So it’s going to be brand new here is that we were commissioned by the Secret Service to protect the next president. Last Monday last week. You know Clinton and Trump had a debate at Hofstra University and the Secret Service approached us and commissioned us to help protect you know that event. [00:23:05] IAN: Was it like if it goes to this side of the podium you know the left side you know just let it go a little further than you normally would. The side will go ahead and keep it back. [00:23:17] SEBASTIAN: You know what actually we were we were surveilling the airspace outside not inside the building but as you can imagine you know they kind of like defined the perimeter even outside of the university to to you know kind of see you know what’s happening. And that’s what we did there we kind of protected that part but and again look these guys are making a tremendous effort to protect these VIPs or in this particular case our next president. So all of the investment that goes in there is toast. If they are not taking into account also though to protect against security threats coming from drones. [00:23:53] IAN: I think there’s almost a guarantee that there was definitely at least one and a half drone incidents around that. I mean there’s a lot of people out there that will throw their drone up in the air to watch a lot more or less interesting things. I don’t know. These debates are pretty entertaining. [00:24:08] SEBASTIAN: So yeah I think I think again, we’re big drone fans but I think anybody when they when they open the box they calibrate they fly around. You are in awe at first of but wow I can I can see myself from that view up there. I can go into places and have this amazing use I think it’s you know psychology wise and you know deep rooted in people that you want to do new stuff right. [00:24:32] So you want to fly somewhere where you haven’t been physically before and take footage. So the case of espionage whether it’s privacy, espionage you know spying out high net worth you know villas and buildings. Oh there we have an extremely amazing example I forgot about it. [00:24:48] IAN: One on your Web site Olympics? [00:24:50] SEBASTIAN: Exactly.That’s a crazy awesome one. [00:24:54] IAN: So real quick. Before we talk about that can you share any cost information on this. Like roughly what is one of like that. I mean are you even able to first of all I don’t want to put you too much on the spot because it sounds like it’s all million dollar idea for sure. [00:25:13] SEBASTIAN: Yes so let me dance around a bit without being too great but it’s at the same time give give you guys a little bit of a hint. So there have been people before in the security business surveilling their you know military vendors it’s you know armies it’s you know guys and these guys traditionally have come with big green trucks and radar systems and they look out lots of miles and kilometers away and those systems are very very expensive. They’re very based on proprietary systems and elements and they involve labor. They involve personnel checking out constantly monitors et cetera. So they are very expensive. [00:25:55] SEBASTIAN: Exactly exactly. We try to be very cost effective. That’s why we when we enter the market with our products we based it on passive passive elements not emitting frequencies ourselves. And there’s you know again coming back to scalability is very easy easy installment it runs automatically. It’s not hazardous and you know it’s off the shelf components we have. And the tracker. [00:26:20] So it’s very very handy. So coming back you need to fit into budgetary requirements with a customer and a prison will never probably you know spent five to 10 million dollars on this. But at the same time the system holds up a lot of value and there’s a lot of you know things we’ve done to give a certain you know compelling proposition. So it has it has a price tag but it’s doable in today’s world. [00:26:47] IAN: Cool. No problem. Yeah. I was curious about that because it sounds I mean it’s just it’s fascinating really. I mean this is shaping up to be probably one of the episodes where I’ve learned the most about a topic that I thought I knew a lot about. [00:27:00] SEBASTIAN: Wow. Thank you. [00:27:01] IAN: No this is great. So back to the back to the the Olympics. [00:27:06] SEBASTIAN: Yes, so we had several high net worth individuals some from royal families approached us and the one we can talk about is from the royal family of Qatar that has a summer residence in the hills of Rio de Janeiro. And they were requiring and requesting rogue drone intrusion protection and we supplied that to them. It was a very fancy and amazing property they had. [00:27:34] IAN: You guys do this. So you also say you’ll sell the solution but you also do it as a service or you also work with contractors to deliver and like weird locations I imagine? [00:27:43] SEBASTIAN: Well OK let me let me be diplomatic with an answer because I think there’s one there’s one that is probably the long term one. How it’s going to evolve and in the short term one I think is a start up you need to be flexible and open right. You need to you need to answer to customer requests you need to be quick on your toes and you can expect you know the world to be perfect for you. So yes our ambition and this this is probably the mid to long term is that we go through partners through value added resellers. But at the same time the market is very new so we need to educate we need to evangelize a lot. And these reference installations are very very important to us. [00:28:19] So that’s why we follow both paths right now. And you know in the real example we did actually go through resellers so somebody that is already having a relationship with that property owner and is selling telecommunications services you know telepresence services et cetera and also their you know current security services like CCTV cameras and you know fences and everything. So we went through them. [00:28:43] IAN: So there is a lot of interest for this. It’s safe to say. [00:28:45] SEBASTIAN: It’s amazing it’s coming from all sorts of parts of the world and it’s coming from any verdict because the pitches again coming back you have a fence you have a lock at your house right. So you’ve got something to protect. So with this new potential threat you need to fill that threat. If you think it is valid and we see that a lot of people had drone incidents already and demand is there. [00:29:09] IAN: What would you say as a company what’s been one of your big challenges? I mean we talked about being a startup needing to be very flexible and you know take opportunities as they come. Is there a specific type of adversity or challenge that you guys face often that’s been difficult? I mean the purpose of the question is you know to help some of the listeners who may be thinking about getting into the drone or now I guess the security industries get a little insight from from a startup. [00:29:38] SEBASTIAN: Yeah I think I think the good thing about the business is that there is strong demand irrespective of how many drones are sold. Right. In essence because drones are in the market whether its a hundred drones or eight or ten trillion drones it doesnt matter. So we we try to help people secure against this one bad guy and people are concerned because there have been incidences. [00:30:04] So in that matter we are kind of in a lucky position that we are a bit disconnected from let’s say studies and market forecasts. We can we can make a case and our customers recognize that case that you know with drone shipments increasing which is phenomenal and it’s great for the industry it’s great for the ecosystem but we’re kind of a bit disconnected from that so that that part is kind of safe and sound for us. I think you know though your question was What are the kind of some of the challenges, our customers are still not all up to speed on what the what the potential threat is. [00:30:41] Some are still forming themselves some have read in the press about it. People might not have seen visually themselves that drone above their heads but they’ve heard about companies and in their peer group report incidents. So we deal a lot was still evangelizing in the market. And you know that’s that’s certainly true for any startup because you know startups tend to be early in the market and earlier than big companies so they tend to need to go out and preach. [00:31:13] But the good thing it’s still working for us on the revenue side that we have people opening the wallet and wanting to have it today. The one thing I probably would say that we you know I wish it was different than you know even more so when I compare to previous startups that I’ve been involved is in the security environment. People tend to only speak behind closed doors so making case studies and references and building marketing collateral is kind of a little bit hard sometimes because people don’t want to issue a PR saying hey we’ve had a drone incident our data center was was attacked and we had a downtime and that led to good point revenues being lost etC. They tend to be very very shy which is you know it’s OK it’s security. But I wish sometimes we could be more articulate about our customer base because it’s much much bigger than actually what you see on the Website. [00:32:06] IAN: You guys have got some killer use cases already that we talked about. So the presidential debate. Rio Olympics, I mean those are some pretty nice ones. Like I said earlier go into the Website and seeing all you know utility companies I mean you might be a little bit miffed at the existence of quote, unquote anti-drone company but as soon as your electricity goes out at your home due to something or maybe your office yeah obviously you’re going to probably feel differently and I think that the more drones popularize and the more drones are sold the more demand there will be for the drone and companies similar to it. So that’s super interesting then. [00:32:47] SEBASTIAN: Yes we’re excited. And again this is not about taking drones necessarily down it’s about making it safer and allowing people that have made an investment in their security just to extend that in and be and be and feel in control so that they can sleep better and that they know it’s an enterprise product that they can provide services to their customers in a much much better way. [00:33:11] IAN: I think we can go ahead and end on that note. So one last thing I heard you guys are looking for interns maybe? [00:33:18] SEBASTIAN: Yes we’re growing and we love interns. We’ve made great experiences in our previous companies was in turn. So anybody who is interested about the space and is excited about what we just spoke about you know do hit us up and search for us on the Web whether it’s a Website, Twitter, Instagram, etc. And yeah there’s so much work waiting here. It’s totally international an amazing team so yeah we’re hungry for it. For people that feel the same way that we do and have the same passion about this in turn bring it on. [00:33:47] IAN: So you guys can follow the DeDrone on Twitter @dedrone and Sebastian’s on Twitter as well @lebastif and check out their Website again. It’s going to be kind of eye opening if you haven’t really researched this area of the industry too much it’s www.dedrone.com. So thanks so much Sebastian. Thanks for having me here at your office. Thanks for joining us and teaching us a little bit about what DeDrones’s doing to help keep the skies safe. [00:34:21] SEBASTIAN: Awesome thanks for your interest. Amazing thanks. [00:34:24] IAN: Hopefully next year I’ll see you at October Fest. [00:34:27] SEBASTIAN: Yes, come by. [00:34:29] IAN: Will do. All right. Everybody fly safe. Cheers.